The few…The proud…The Expendables. Barney Ross (Sly Stallone) is the leader of The Expendables, a highly trained collection of mercenaries with various skillsets who specialize in challenging missions. After resolving a mission in the Gulf of Aden with some Somali pirates, Barney and his cohorts Lee Christmas (Jason Statham), Yin Yang (Jet Li), Gunnar Jensen (Dolph Lundgren), Hale Caesar (Terry Crews), and Toll Road (Randy Couture) receive a contract from Mr. Church that will place them on Vilena, an island on the Gulf of Mexico. The mission? Eradicate a relentless dictator by the name of General Garza. Almost immediately, the objective changes and The Expendables will have to adapt. What was once just a “simple” elimination assignment has now expanded into rescue, not to mention survival amid insurmountable odds. With all of these big name action stars from yesteryear and today, it should be no surprise as to what one is getting themselves into when watching The Expendables. What is that you may ask? Guns, blood, gore, language, and stuff blowing up mixed with well timed one-liners. This film was tailor made to have a good time just as long as expectations were realistic. But, even with the lowered expectations, it is underwhelming for a few reasons. Surprisingly, it is played rather straight. I would like to think that this movie knows what it is, and yet, so much of it is overly serious. It is a bare bones story; nothing is truly memorable. There are some bad guys, and some good guys who must take down the bad guys. It is by the book, functional, and all that is really needed for this. What isn’t needed are the attempts to give this some drama and heavy moments in an effort to make the audience care for the characters. Whether it be an authority figure struggling with his alignment and relationship with his child, or one of the crew going on and on about how a failed mission shaped his life, the heavy fails to resonate and comes off as extremely forced. When there aren’t time wasting and bore-inducing moments, the film is exactly as advertised: A balls-to-the-wall, testosterone fueled thrill ride. Problem is, there is a lack of it, and what does exist vastly underwhelms in many scenes. It has been done before, and better, in other films. Sure, that may be the point, but old action staples can still be cool to watch. So much here just was ho-hum. Additionally, it is somewhat jarring to see so many set pieces rely on CGI, and if there were anyone who you would think would attempt to stray away from it as a director after so many of his past roles were rooted in realistic action, it would be Stallone. That isn’t to say that the action is entirely fake, just most of the payoffs (read: kills). Much praise has to be given to these stars for their physical commitment to their roles. 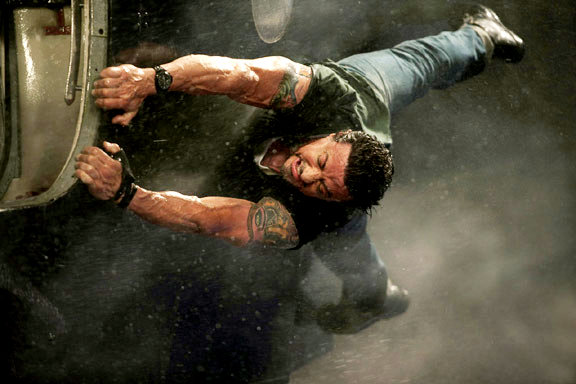 Reportedly, Sly suffered 14 injuries when shooting this movie, and if that does not show the willingness to make the fights look real, I am not sure what does. Most if not all of the featured fight scenes and stunts look to be done by the main cast, and if not, kudos to the editing. 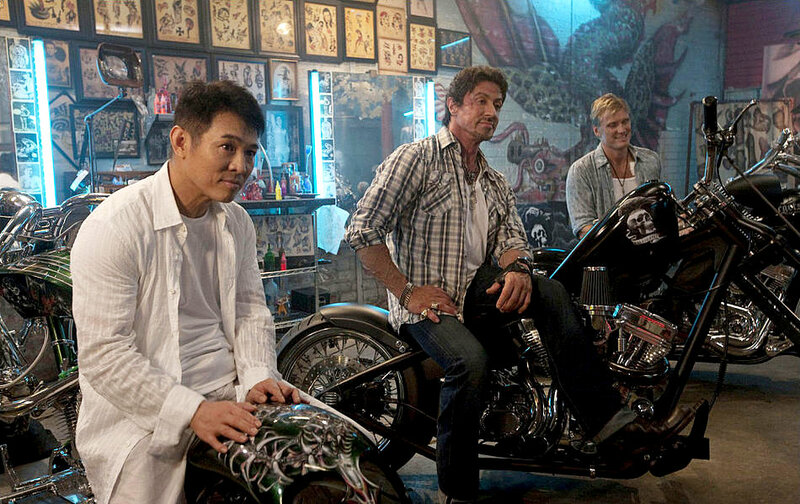 Comprised of an ensemble cast, you would assume The Expendables to give adequate screen time to all of its members. But, this couldn’t be further from the truth. For a sizable chunk of the runtime it is pretty much a buddy cop movie. With how the trailers made it a point to showcase everyone, for it to go this route is disappointing. Stallone is OK as the seen-it-all-before leader, but Statham does the best in this film while giving his character, well, some character. Out of all the “heavyness” applied to the film, his is the most interesting. Still, the full team is hardly seen aside from (SPOILERS!) the beginning and the end. Which is a shame, especially for guys like Jet Li and Terry Crews, who are and have been generally entertaining in many past roles. There isn’t a ton for them to do here, or to really make an impression on us. 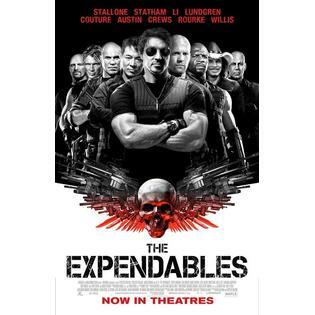 Others of note include Steve Austin, who plays the hired muscle for the opposition, and Dolph Lundgren, one of the more unstable compadres in the Expendables gang. Shot in Louisiana and Brazil, the movie does possess a guerrilla warfare type feel that I am sure it was going for. It looks unbearably hot with danger prevalent in every step. It would have been great for more action to occur during the day though, as so much of the explosive moments take part at night, making some of the action more drab and harder to follow than it should be. Ultimately, The Expendables struggles a bit more than anticipated with stuff that should come easy for it, like action and humor. As both a homage to 80’s works of yesteryear and a 2010-era action film, it never comes together as desired. Photo credits go to aceshowbiz.com, screencrave.com, and sears.com. I’m gonna get on the second soon, which I have heard is better. So I should be ready for the third! Thanks for the comment Nostra. I agree completely. The serious parts were too serious and the funny parts weren’t funny. Plus the action wasn’t shot well. That part at the end with about 10000 explosions just got tiresome. It could have been silly fun but i was willing it to end. Nice to see we share the same sentiment. No one expected greatness, but it was really shocking at how dis-interesting this was in most spots. It’s a goofy flick, but it was a fun one. Still, it’s quite messy and I was more than happy that they pretty much fixed most of that in the sequel. Good review Jackson. Thanks. I wanted to like this, but there is tons that falls short and to me I just became way more bored than I ever would have thought. Good to know the sequel resolves most of the issues. Gonna have to give that a watch soon. Nice review. I gotta say I had a lot of fun with this one. Sure it’s loaded with flaws but it was a lot of fun for me. The others are right, the sequel is a bit better. Thanks for the comment Keith! I was just surprised at the uninteresting action and forced humor. But I am excited for EX2 & even EX3. I knew what I was getting into, but I expected to at least wow me from an action standpoint. It didn’t sadly :(. Gotta check out 2 & 3 soon.